A good judge of new small business. 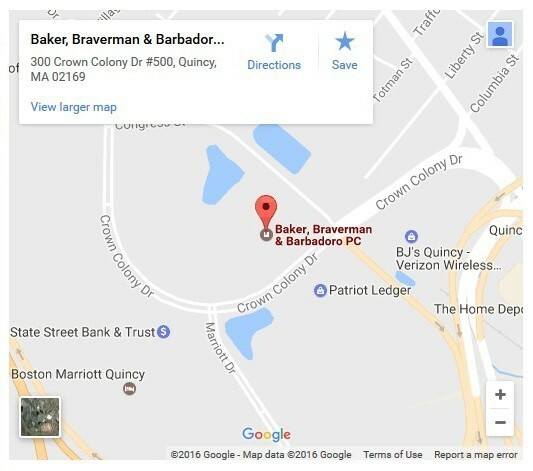 Baker, Braverman & Barbadoro P.C. helps select winner of Quick Pitch competition. When it comes to presentations before judges, the attorneys at Baker, Braverman & Barbadoro P.C., are used to being on the other side of the bench. On April 4, Attorney Warren Baker was in one of the judge’s seats, listening to small business pitches from seven budding entrepreneurs as part of the Quincy Center for Innovation’s Quick Pitch competition. Held at the Center’s Eastern Nazarene College location, the Quick Pitch competition gave aspiring entrepreneurs the opportunity to pitch their business ideas before a panel of judges with the opportunity to win up to $2,500 to get their business idea off the ground. The judge panel consisted of Quincy Center for Innovation sponsors, Center volunteers and members of the local business community. “The Firm specializes in working with small businesses and we work with many innovative clients. The ideas presented by the seven entries in the Quick Pitch were well thought out and extremely creative,” said Baker. This year’s winner was Cohasset native Mike Filbey and two of his former classmates, Moshin Khan and Mark Lindquist, who won for their enterprise Canary, an online marketplace that helps people buy and sell unwanted items locally while donating a portion of each sale to local charities. Other winners included Richard Keough of Quincy, taking second place and winning $1,000 in kick-start money for his Tablet Pistol Grip 360, a handle that attaches to the back of a digital tablet to make it easier to hold and use. Luis Mora, a junior at Eastern Nazarene College who grew up in Hyde Park, won the student contest and $1,000 for Mora Communications, a training program that helps instill confidence and public-speaking skills in high schools students. Similar to the premise of the hit television show “Shark Tank,” the Quick Pitch contest had entrepreneurs pitch their ideas to a panel of judges, who in turn peppered the participants with questions about their ventures. Questions revolved around key business pillars such as sales, marketing, overhead, competition and legal protection. “We volunteer time at the Innovation Center counseling entrepreneurs, so I had some idea as to what to expect but these contestants really knew their stuff and you could feel the passion and commitment behind their ideas,” said Baker.